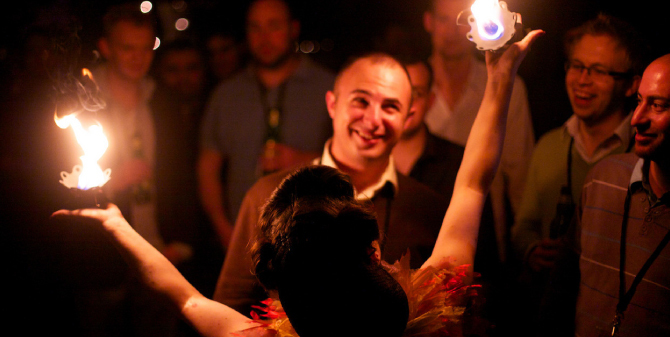 Why should you attend a Distilled search conference? October sees Distilled host our annual London conference. For the past two years we have been running a hugely successful advanced search marketing conference for the digital and search marketers of the UK, Europe and beyond, bringing some of the best speakers in the industry to present on their latest findings and share their expert knowledge. We have rebranded to the new name of SearchLove and can’t wait to run our first event under this name. We have been working hard to improve how we run the events, from the first stage of booking your seat, to the benefits when you’re sat in your seat. Why should you choose SearchLove? 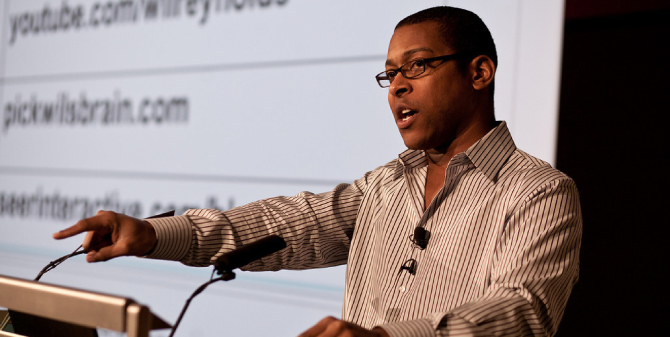 We work really closely alongside our speakers, to ensure the content of their session is as advanced and actionable as possible. We invest a lot of time configuring the logistics and scheduling of our conferences to make best use of every moment over the two days. We aren't an events management company, we are working in the field of search, so we understand and know what you want to learn about, hear about, and discuss - because we want the same. We try to be as innovative as possible with new ideas for the events. We realise that two days of intensive training can be information overload so we do everything we can to make this a little easier, from providing you with the slides, to providing the beers. 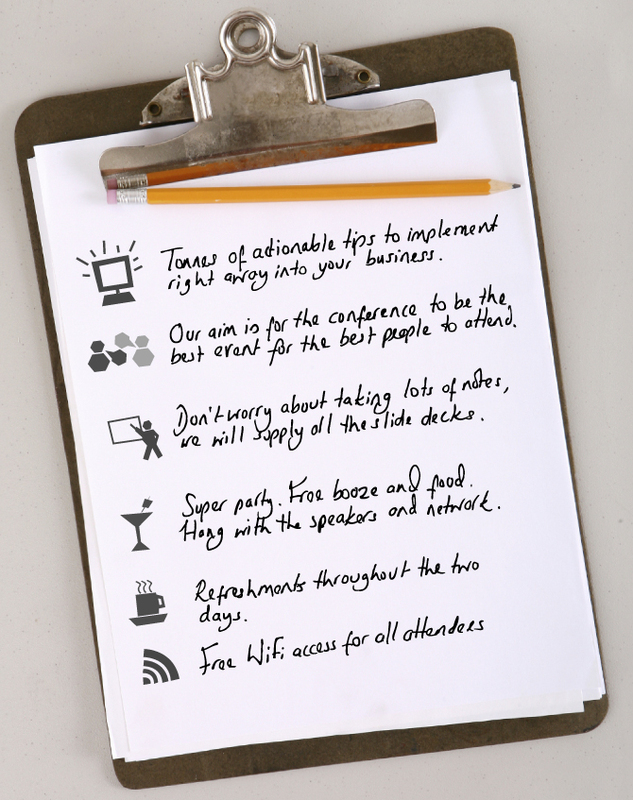 From the moment we start working on an event, we have a clear set of objectives which we all live by. It’s a small team that works on putting the events on and this allows for intricate collaboration, but also means we are all on the same page. More importantly though, it means we have a really close relationship with our speakers. We don’t allow speakers to pitch, we select all of our speakers very carefully, and we ensure that we have seen them speak elsewhere, so that we know they are at the level we want for our delegates. Once the speakers are confirmed we have calls with them, invite them to send over their deck as they are working on the content to check it’s relevant, advanced and actionable. To quote Will, he always says to the speakers ‘imagine an audience of myself, Tom and Rand, that’s the level of expertise you should be aiming for’. The reason he does this is because (from feedback) we know our delegates don’t want to hear what they already know, and if something goes over their head they will just look it up afterwards. We also avoid panels; our speakers are generally given a 45 minute window, 35 minute slide deck with 10 minutes for Q&A on their own. We find that this allows for much more in-depth presentations, the speakers can explore their ideas and findings in greater detail. 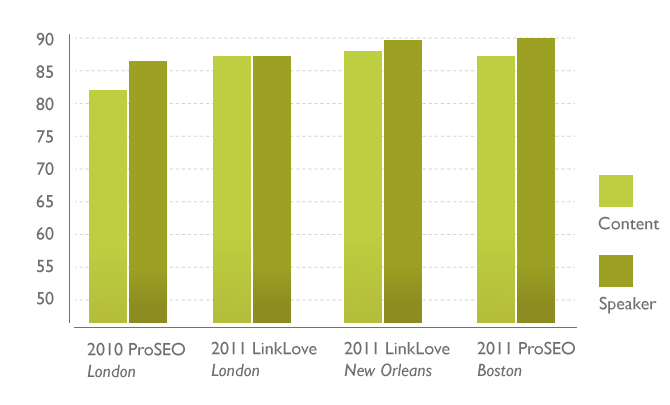 Average % positive feedback (ratings of good or excellent) for content and speaker for 4 conferences: ProSEO 2010, Linklove LDN 2011, Linklove NOLA 2011, ProSEO Boston 2011. 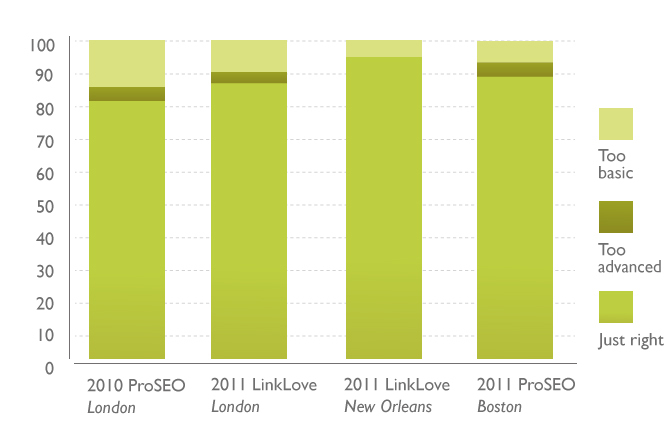 Overall content difficulty ratings for 4 conferences: ProSEO 2010, Linklove LDN 2011, Linklove NOLA 2011, ProSEO Boston 2011. We still want to improve on these ratings, what would make us feel like we had really done our job is for a slightly larger proportion of our delegates to feedback that the level was too advanced. If you’re keen to see what all the fuss is about, we have added videos of the conferences to our online store for you to purchase and download (in HD). Filmed live at the conferences, we think that the videos are a great reminder of all the awesome tips and tricks that our speakers share at the conferences, as well as being a great learning tool for anyone who wasn’t able to attend. “You work with some incredibly smart people. Prior to seeing these lectures I knew nothing about SEO; but now I’ve been inspired to go away, totally revamp my entire website, start a link-building campaign and expand on my social media presences. Would recommend these videos to anyone."